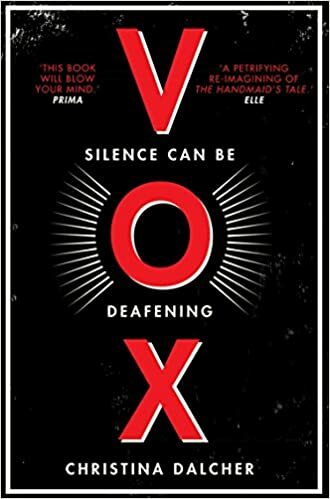 VOX, the debut novel of Christina Dalcher is a political dystopia and is undoubtedly one of the best books I’ve EVER read! It has a strong resemblance to the current affairs and is unsettling, chilling, thought evoking and impactful. It shows you how dangerous political illiteracy can be and the threatening consequences of keeping quite while you still have a voice. The novel is set in an America where the ‘PURE’ movement has gained momentum. The rights of women were seized over night and were sent back to their homes. Women were not allowed to work or travel or even speak more than 100 words a day. They were not even allowed to receive a mail but only a man had the right to do so. You will personally relate to EACH of the character in the story. You know Jackie?! The one who’s always in the rallies, shouting at her highest pitch about the ‘minor-est’ inequality they see?! And you of-course know Jeanie. You got to know her. Maybe you even are her, who never fails to tell the Jackies to stop being so hysterical. You probably also know Patrick, who isn’t a misogynist prick but is too polite to call it out! And you also know women like Olivia, who don’t mind being a chattel in a man’s world. The plot is disturbing and yet very very engaging. Reading it made me so angry. And at the same time it made me feel helpless and suffocated. But mostly, VERY ANGRY. At the society and at myself. Because I know Jeans and maybe I’ve been her too. VOX is available in Hardcover, Paperback, and E-book. Great review! I agree with what you said about how relatable the characters are; it was so easy to find parallels between them and people I know in real life. It’s scary to think that something like this could actually happen!